Since the last article, part 2, I've been refreshing my memory on the topic of BJTs, cracking open my old college text, Microelectronic Circuits (Sedra, Smith) , which I recommend as a good reference. There's a newer, way more expensive edition available (Microelectronic Circuits Revised Edition ) but I think the 2nd edition is good enough. At any rate, I wanted to start from scratch with the motor, and work outward from there to try and come up with a better circuit. Typically one wants to drive the transistor well into saturation by making sure IB is 2-10 times the saturation value of IB. This is called the overdrive factor. Ultimately, we control the amount of base current by selecting the an appropriately sized base resistor, RB. Note that if we stick the motor on the transistor's emitter, then it limits how much extra base current we can supply at the base. Instead, it is typical practice to place the resistive load of the motor bewteen the voltage source and the collector terminal. 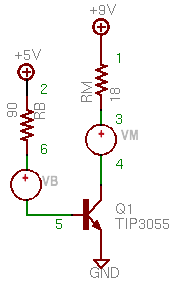 That way the only resistance limiting IB is the base resistor. The book says to assume VCEsat is approximately 0.3V. Upon looking at the data sheet for the TIP3055, actually varies depending on the IC but as long as we estimate VCEsat on the low side, it seems to me that we'd end up with a larger IB which will only ensure we are driving the transistor well into saturation. This time, let's do an operating point analysis. As mentioned previously, the OP command tells SPICE to find out the steady-state of the circuit and the PRINT commands specify what variables to print. We are interested in the base voltage, V(5); the collector-emitter voltage, V(3); and of course the base current, I(VB) and collector current, I(VM). Below is the SPICE deck to accomplish all that. And when we run it, we get numbers that actually kind of match what we expected. Cool. Our IC is about 490 mA, IB is 47 mA and VBE is about 0.77 V. It's not exact because we were using some estimates, but it's close enough. Note that the ratio of IC to IB is 10, considerably less than a ß (hFE) of 100 that we'd expect in active mode for a collector current of about 0.5A. In other words, we're forcing in extra base current without any appreciable gain in collector current. That's saturation. 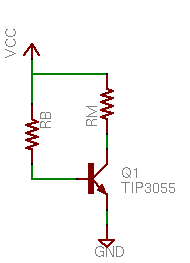 Base and collector current are negligible and there's no voltage drop across RM or RB. In a word, the transistor is off. Just what we expected. One little gotcha. As I mentioned, I want to drive this circuit with an ATmega168 which is limited to 40mA per data pin, according to the datasheet. So in the next article I'll incorporate a second transistor to drive the first and add that to the SPICE model above and see what we can come up with. Nice posts on SPICE. We use a multitude of different brick systems from 5V to 12V, but we recently made a revision #4 circuit that uses the BASIC stamp, 12V sealed battery, and a PS2 wireless controller. The circuit supports up tp 13 PWM cables/ VICTORs and we use a smaller 12V battery, about 3" x 1.5" x 2"; not the marine 12V for our 120lb robots. Thanks for the comment! Good to hear from you again. Sounds like some pretty sweet controllers you are putting together there!